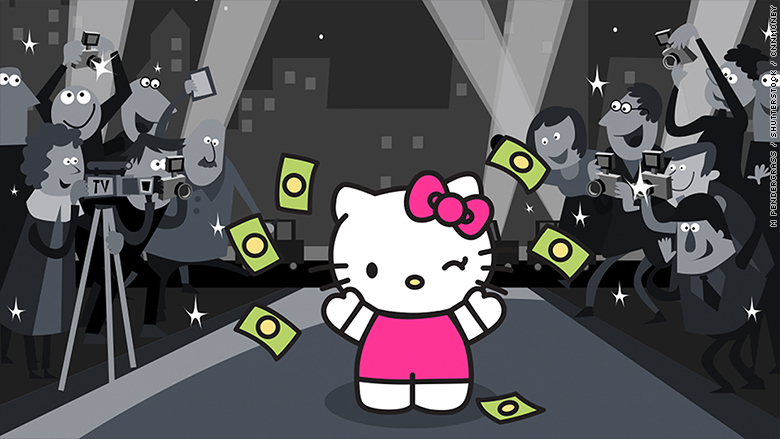 Let's face it: Hello Kitty is really cute ... and extremely profitable. Since first appearing 40 years ago on a tiny vinyl coin purse, Hello Kitty has become the cornerstone of a modern business empire. Fans can buy Hello Kitty sneakers, paper towels, panini makers, chopsticks, wine and more. They can even eat Hello Kitty dumplings in Hong Kong, fly on a Hello Kitty plane to Taiwan or hang at Hello Kitty Con in Los Angeles. No doubt about it: Hello Kitty is a massively successful pop icon that has netted a gigantic fortune for her parent company, Japanese firm Sanrio. It's also a brand that has gone through a revival in recent years, thanks to a massive push to license Hello Kitty's image for a variety of uses, a business strategy Sanrio implemented around 2009. "You can find Hello Kitty on so many different kinds of products appealing to a whole range of customers -- she can appeal to the five-year-old, but she's also going to appeal to the 15-year-old, and also maybe the 50-year-old," said Christine Yano, an anthropology professor at the University of Hawaii, and author of a book on Hello Kitty. "By licensing agreements ... [and] dealing with different kinds of niche markets -- that's the marketing genius." Founded in 1960 by Shintaro Tsuji, Sanrio pulled in $6.5 billion in licensing retail sales last year, with 50,000 products and 15,000 shops, making it the world's sixth-biggest licensor. It ranks right behind companies like Disney (DIS), with Mickey Mouse and its popular "Frozen" characters, and Mattel (MAT), which owns Barbie, according to License Global. The company's shares are up 33% so far this year in Tokyo, beating the benchmark Nikkei's gains of 13%. "Hello Kitty is a profit-making machine," Yano said. Years ago, Sanrio focused more on manufacturing products for sale in its own retail stores. But "the margins were quite small, and their financial condition was getting worse and worse," said Credit Suisse analyst Masashi Mori. Everything changed in 2008, when managing director Rehito Hatoyama joined the company. Hatoyama, who championed aggressively licensing Hello Kitty, quickly turned things around, Mori said. The appeal is clear: Licensing allows Sanrio to take on far less risk, especially when getting into new businesses. But the company can still control Hello Kitty's image -- from the artistic design to the messaging around the product or use -- while raking in royalties. "We take Hello Kitty as a celebrity, so you have to think of yourself as a manager of an entertainment company," said Caroline Tsang, a chief operating officer for Sanrio in Asia. "Hello Kitty is number one, and you have to choose what is suitable for her -- you cannot ask her to do whatever." Anything lewd or sexual, for example, is definitely out of the question for cute, sweet Hello Kitty, she said. 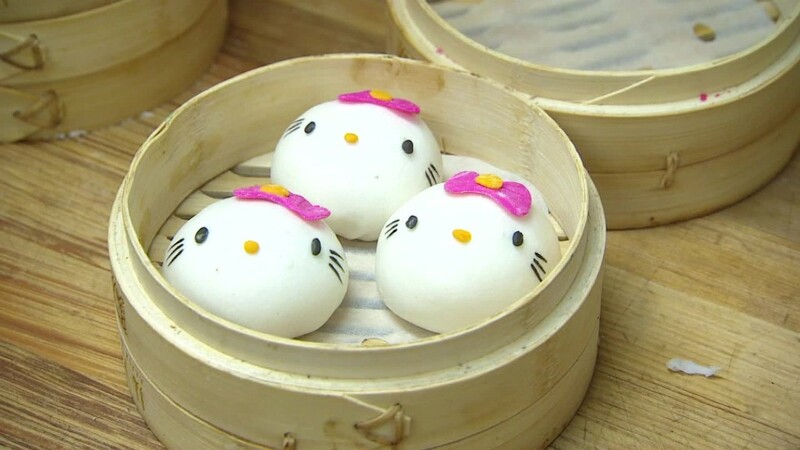 Quality control is a big deal: Details from the decor to the tableware at a Hello Kitty dim sum restaurant in Hong Kong had to be approved by Sanrio, said owner Man Kwong. Company employees also tasted and critiqued every dish on offer, making sure Hello Kitty's facial features were proportionally accurate on each dumpling. The food had to be decent, too -- some dishes took seven tries before getting the green light. "At Sanrio, we tend to be more hands on," said Tsang. "We're more like a one-stop service," providing design expertise and even publicity for various projects. Analysts estimate Hello Kitty accounts for roughly 75% of Sanrio's $142 million annual operating profit, and brings in most of the $600 million in company revenue each year. Attracting young fans is essential, because "when they are grown up, they will be able to transfer it to their kids," said Tsang. "So we have to make sure young mothers remain our core fans -- that's the power of treasured memory." In just the past few years, the company has aggressively catered to older fans, launching collections under luxury jewelry brands Swarovski and Mikimoto, makeup lines at beauty chain Sephora, a Hello Kitty mascot for baseball team Los Angeles Dodgers, and even a Hello Kitty 5k race in Singapore. Hello Kitty is even loved by celebrities -- Lady Gaga was photographed in a gown made of Hello Kitty plush toys, while Katy Perry got a Hello Kitty tattoo on her middle finger. And while Hello Kitty does see competition -- most recently from Disney's Frozen characters, which got more shelf space in stores this last year -- experts say she has a lasting power that other characters simply don't. "Nobody has been able to replicate the kind of global fascination with a character set as Sanrio has done," said Marty Brochstein of the International Licensing Industry Merchandisers' Association. "Hello Kitty struck a chord."